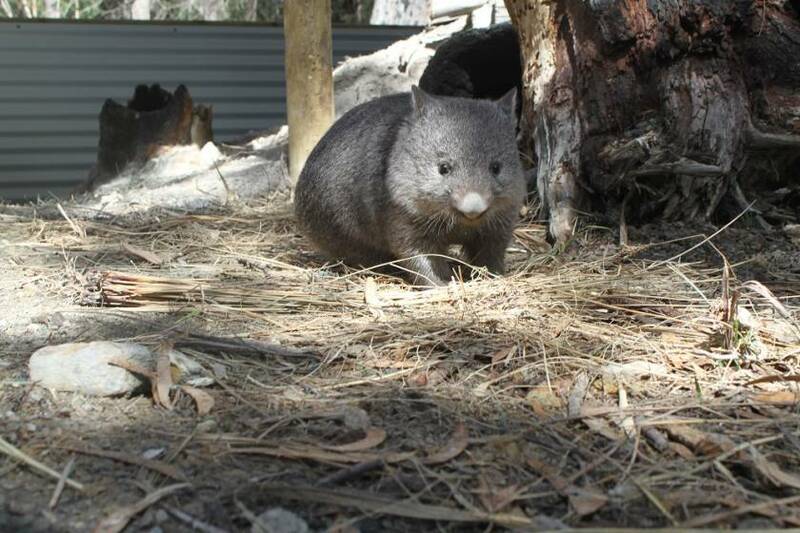 There are three subspecies of common wombat -- Vombatus ursinus hirsutus which is found on the mainland, Vombatus ursinus tasmaniensis which is found in Tasmania and Vombatus ursinus ursinus which was once found throughout the Bass Strait islands but is now restricted to Flinders Island. The common wombat was once found throughout south eastern Australia but now, partly as a result of European settlement, is restricted further to the south. It occupies Tasmania, eastern New South Wales and eastern Victoria with scattered populations in south-eastern South Australia and south-western Victoria. There are two other species of wombat, both found on mainland Australia - the southern hairy-nosed wombat and the threatened northern hairy-nosed wombat. Wombats can be seen in a number of our national parks, including Narawntapu (formerly Asbestos Range) and Cradle Mountain National Park. More information about these national parks can be found on the Parks and Wildlife web site . In Tasmania the wombat is widespread and found from sea level to alpine areas but shows a preference for heathland, coastal scrub and open forest where soils favour their burrowing habits. Wombats often dig their burrows in the areas above creeks and gullies. Burrows can be up to 20 m long and more than 2 m below the ground, and have numerous connecting tunnels and entrances. There may also be more than one nest in the burrow, which they make from sticks, leaves and grasses. 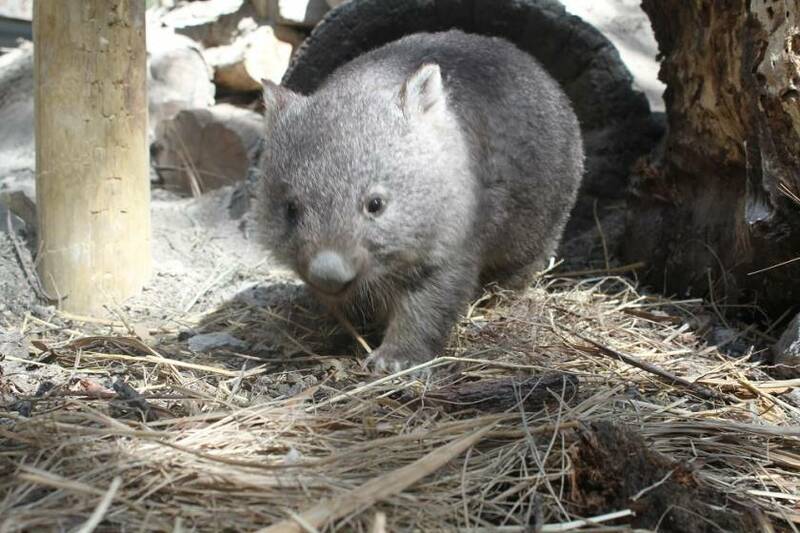 Wombats are mostly nocturnal, usually coming out at night to graze when temperatures are lower. However, in cold periods they may sometimes be seen about during the day either grazing or basking in the sun. They graze for between 3 and 8 hours a night, during which time they may travel many kilometres and visit up to four burrows within their home range to rest or tidy up the burrow. Although they are solitary animals, with only one wombat inhabiting any one burrow, the overlap of home ranges does occasionally result in a number of wombats using the same burrow. To avoid the overlap of feeding areas they use scent-marking, vocalisations and aggressive displays. Wombats not only leave their burrow to graze but will also spend time rubbing themselves against logs or branches. If used often enough, these rubbing posts may be recognised by their worn or polished appearance. Although the wombat may breed at any time of the year, mating most often occurs during winter. The female has 2 teats in her pouch yet despite this, 30 days after mating, only one young is born. The juvenile remains in the pouch for 6 months, after which it stays with the female until it is 18 months old. From the time the juvenile leaves the pouch, it begins to substitute increasing amounts of plant material for milk until, when about 15 months old, it stops suckling altogether. Sexual maturity is reached at 2 years of age and wombats live for in excess of 5 years in the wild. Due to the long period of time that the young is dependent on the mother, it is likely that females only rear one young every two years. However, if the young dies early, or if conditions are good enough for it to leave the pouch early, she may raise another. It is protected in all States. •Contain dogs at night to prevent them roaming, particularly in areas where wombats are known to live. 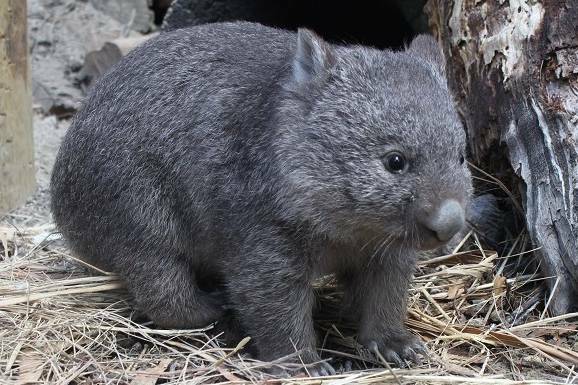 •If wombats are causing damage to fences, heavy hinged gates can be installed which will allow wombats to push through but prevent less powerful animals from entering. •Drive carefully in 'wombat country' -- apart from killing or injuring them, wombats can damage cars. •Occasionally young wombats become orphaned and require nurturing. It is important that specialist advice is obtained on their rearing and release as they can become very boisterous if not treated correctly.